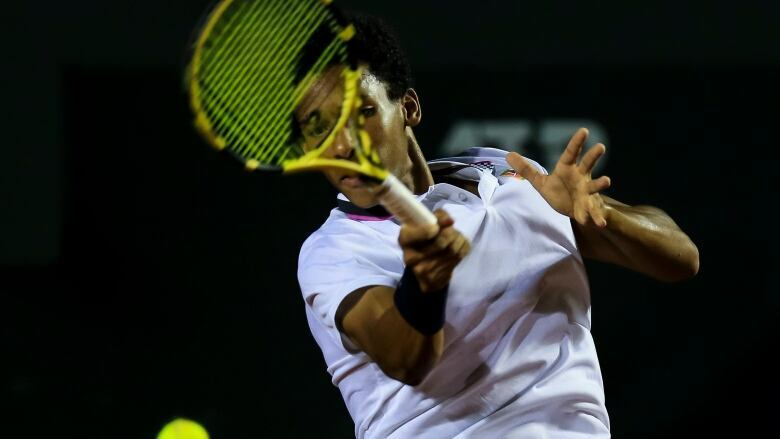 Canada's Felix Auger-Aliassime defeated Jaume Munar of Spain 6-4, 6-3 in the quarter-finals of the Rio Open on Friday to reach the semis at an ATP tournament for the first time in his young career. The 18-year-old from Montreal broke Munar three times in the second set to seal the win. He began the second set with a break, broke Munar once more to go up 4-3 — rallying from 0-40 down to take the seventh game — and again in the deciding game. Auger-Aliassime will face Argentina's Pablo Cuevas in the semis on Saturday after Cuevas defeated Albert Ramos-Vinolas of Spain 6-3, 3-6, 6-3 in their quarter-final. The Canadian won 63 per cent of his first-service points against Munar and saved 2-of-5 break points throughout the match, which lasted one hour 38 minutes. A wild card in Rio, Auger-Aliassime has had a solid run at the ATP 500 tournament this week, starting with an upset victory over world No. 16 Fabio Fognini of Italy in the first round. That was the biggest win of Auger-Aliassime's career and his second time beating a top-20 player. The No. 104-ranked Auger-Aliassime also defeated then-No. 18 Lucas Pouille in the opening round of last year's Rogers Cup in Toronto. Auger-Aliassime will rise to within the top 80 when the latest rankings are released Monday. Munar is ranked No. 66. The 21-year-old was a semifinalist at last year's Next Gen ATP finals. Earlier Friday, Aljaz Bedene defeated Hugo Dellien 4-6, 6-2, 6-3 and Laslo Djere downed Casper Ruud 6-4, 7-5 to reach the semis. Bedene and Djere play each other Saturday.